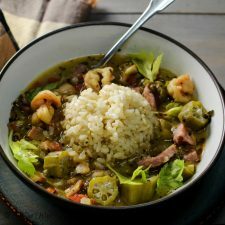 Mardi Gras is just around the corner and what could be more emblematic of New Orleans than Louisiana Shrimp Gumbo? Even if you can’t travel to The Big Easy you can sample its delicious cuisine right in your home. Mix up a big pot and celebrate Fat Tuesday the NOLA way. This recipe has been updated from the original February 2015 version in order to provide a better experience for our readers. Last update February 2019. For this recipe you will need: shrimp, kielbasa sausage, bacon, onion, celery, red bell peppers, jalapeño peppers, garlic, flour, oregano, thyme, dried basil, salt, pepper, lemon juice, dry sherry, Worcestershire sauce, clam juice, chicken stock, okra, scallions, brown rice. Seafood Gumbo is a rich stew full of different meats and seasoning. I discovered gumbo crosses all class barriers — Cajun or Creole — it appears on the tables of the poor as well as the wealthy. I learned this when we had dinner with Honey’s Louisiana born Aunts Emilie and Adèle. The dinner was going along just fine until I asked them how to make a proper gumbo. I swear those two sounded just like Ouiser Boudreaux and Clairee Belcher in Steel Magnolias. But in-between the friendly bickering I did learn quite a bit about shrimp and chicken gumbos. Just like Aunts Emilie and Adèle have different ways to cook their gumbo they couldn’t actually claim that the dish and method of preparation originated with either the Creole or Cajun people. 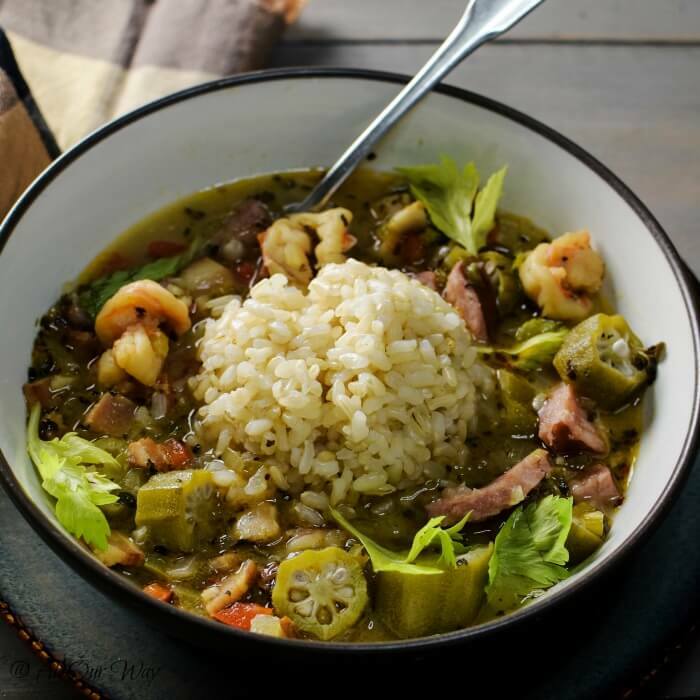 In fact, shrimp gumbo is a perfect example of the melting-pot nature of Louisiana cuisine: Gumbo derives from a West African word for okra, suggesting that gumbo was originally made with okra. But there are those who use filé, which is dried and ground sassafras leaves, in their gumbo and that is a contribution from the Choctaws and possibly, other local tribes. Then there is the French influence in the use of roux, although the roux in gumbos is much darker than in French cuisine. Although they disagreed on countless things, the Aunts finally agreed on these seasonings for their gumbos. Aunt Emilie admitted that Creole seasoning mixes use more paprika than Cajun mixes. 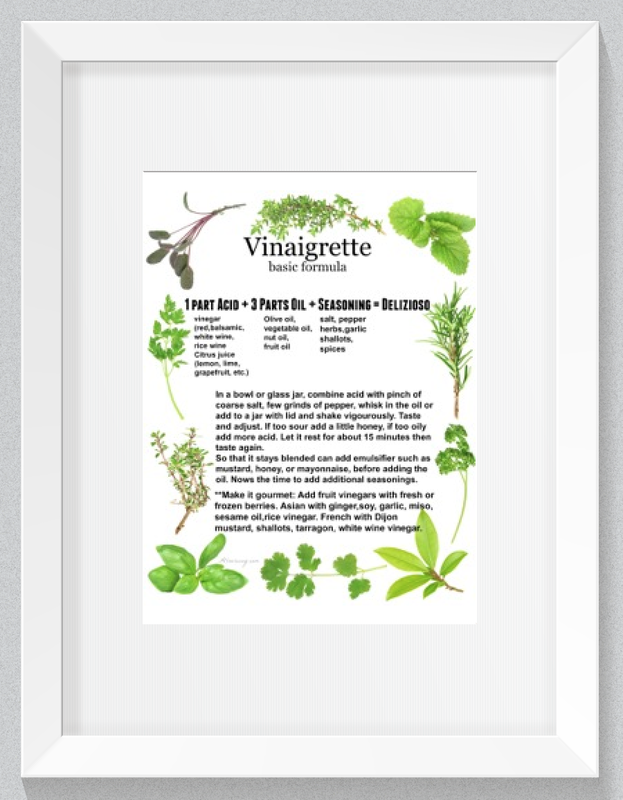 Also, the mixes often include sweet basil, celery seed and white pepper. I suspected that’s because Cajun cooking is rural and basic while Creole is citified. Aunt Adèle confirmed my suspicions by saying that she grew up in the some of the fancy seasonings weren’t readily available to them. People are very passionate about what constitutes the texture and consistency of a “proper gumbo” and exactly what should be in it. 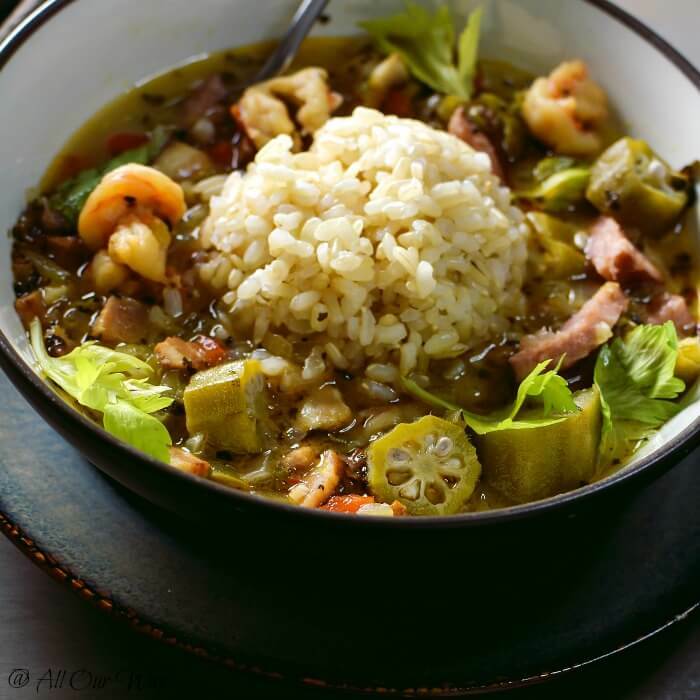 Some Cajuns argue that no tomatoes or okra touch their gumbo, while some say that filé is necessary for the taste and texture. I certainly wouldn’t want to be in the middle of some of those arguments — they get fighting mad!! Every October there’s a World Championship Gumbo Cook-off in New Iberia, Louisiana. One ingredient that all agree upon — rice. Both of them use the “the Holy Trinity” which is their version of the French mirepoix. Sometimes also garlic and parsley. Part of gumbo’s appeal is that it’s very forgiving of the cook. Measurements don’t have to be exact you may substitute with what’s at hand. It’s a lot like our Chicken Minestrone Soup. A seafood gumbo that is meaty and very satisfying. 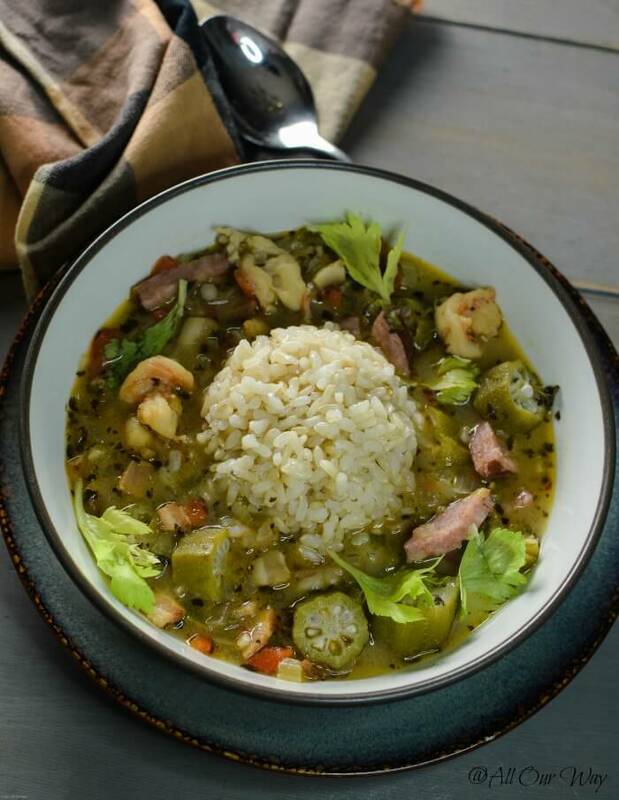 How about giving Louisiana Shrimp Gumbo a try? You can substitute chicken for the shrimp and chicken stock for the clam juice making it Chicken Gumbo. And believe me this seafood Gumbo is as good as it looks. Give it a try — you’ll love it. And as they say in Louisiana. . .
. . .Laissez les bons temps rouler! – Let the good times roll! All of these recipes are hearty family favorites we know you’ll love. Thank you for being part of All Our Way! This is just like the Clam Juice we use in our recipe. Clam juice is so handy especially when you want that additional clam flavor. We even splash some more juice in the pot when we make mussels or a fish stew. When we make fish chowder we add some of this tasty juice to enhance the flavor of the chowder. 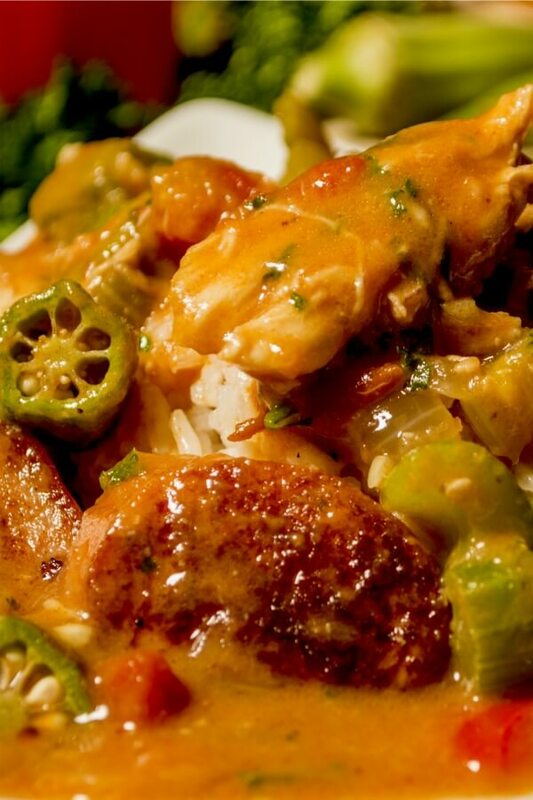 Whether you call it Cajun Gumbo, Creole Gumbo, or just Gumbo we call it delicious! This stew is so forgiving. Add whatever meat you want. Chicken Gumbo is very popular and you can easily substitute it for the shrimp. You prefer Andouille sausage to the Kielbasa? Put in what you and your family like. The blending of cultures is what gives this stew a depth of flavor that’s missing from other dishes. We guarantee that you’ll want to celebrate Mardi Gras more than once a year. If you like this recipe, please consider giving it a five-star rating. This helps others decide whether to try the recipe. This stew is rich in the flavors of the shrimp and smoked sausage. The okra and a darkened roux give it a thick depth and the dish is finished with rice. 1 pound medium shrimp 31-35 count peeled, deveined and sliced in half lengthwise -- they'll curl up when cooked. 3 jalapeno peppers we left the seeds in -- we like it HOT! An alternate method is to add 1/2 cup converted-style rice at the final boil with clam juice and broth. Fry bacon until crisp in a large soup pot over medium-high heat. Remove the bacon with a slotted spoon and let drain on paper towels and set aside. Pour off bacon drippings, reserving 5 Tablespoons. Return the pot to the burner. Saute shrimp in 2 Tablespoons drippings for 3 minutes over medium heat, stirring constantly. Remove shrimp and set aside. Saute onion, celery, bell pepper, and garlic in 3 Tablespoons drippings for 3-4 minutes, stirring constantly. Combine flour and seasonings; stir into vegetables. Cook 2 minutes, stirring constantly. Deglaze with lemon juice, sherry, and Worcestershire, scraping up bits from the bottom of the pot. Add the clam juice and broth ( also the 1/2 cup converted rice if you want it cooked in the gumbo) Bring to a boil, cover, reduce heat to low, and cook 20 minutes. Stir in okra, scallions, shrimp, and bacon. To serve you can pour the gumbo over a serving of rice or you can add a scoop of rice on top of the gumbo like we did. * Don't cook the okra too long - it will turn stringy. 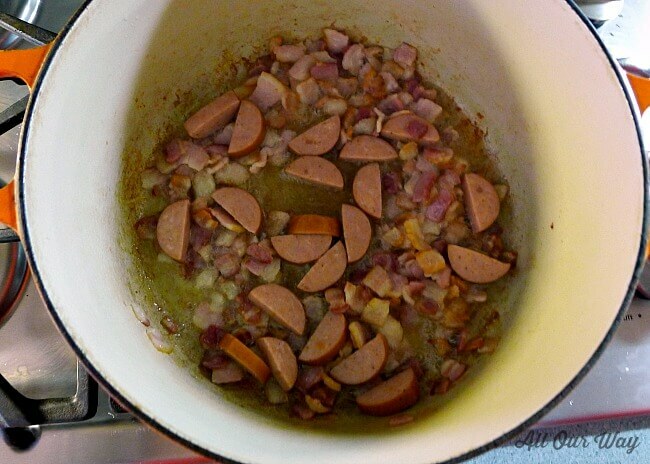 ** We use kielbasa sausage instead of andouille because we find it has less fat in it. ***Whenever we make a dish we have all the items prepped ahead of time. For instance, we will mix the flour with the seasoning in a dish and in a measuring cup we will have the deglazing liquid ready to pour into the pot. Inspired by a gumbo recipe in Cuisine At Home - June 2003 issue. Note: Recipes and content from ©2014- 2019 All Our Way are copyright protected. Please do not use content or recipe without prior written permission. If you want to share the information, please link to this post. Grazie. Marisa I love gumbo! I don’t often find andouille sausage here but whenever i do I buy it to make sure I can make this. It’s so delicious! Your recipes always look so yummy! Photos are excellent! Thank you Marisa for linking up with us at the #BloggingGrandmothersLinkParty 35! Shared x 3. Wow this looks amazing! So… I’ve never had gumbo. Crazy, but true! But now I feel confident that I could make a great gumbo at home and I’ll be saving this for when that time comes. Thank you! I haven’t had gumbo in years! I used enjoyed it when we visited New Orleans every year, but we stopped making those trips after we had children. Now that the kids are older, a trip to the big easy is in order, but until then, I’m going to try your recipe! It looks amazing! Thanks for the history of gumbo and the differences between Creole and Cajun! I’ll make sure to keep all your tips in mind when I make it and maybe my New England self can make a proper gumbo too. 🙂 I’ll need to get to the store soon if I’m going to make it for Mardi Gras this year. Would you believe I’ve never even tried gumbo. Sounds like everyone in your family is an expert of some sort on gumbo! Love that history to this dish. Now I will just have to make it. Indeed. Mardi Gras season is upon us here in the South. You have a great gumbo recipe. We love New Orleans and the foods that we experienced when visiting. You can’t do any of their recipes justice unless about a pound of butter is included LOL! This gumbo looks amazing and I’ll be giving it a try. John and I just love recipes like this that have an amazing balance of flavors. We celebrate everything and this is just in time to plan our Mardi Gras gathering! Woo hoo! Hi, Julie! Les le bon temps rouler!! Have a great party! Loving the sound of this southern style recipe. I would love to visit LA just for the food alone. This looks perfect for a nice weekend dinner with friends. 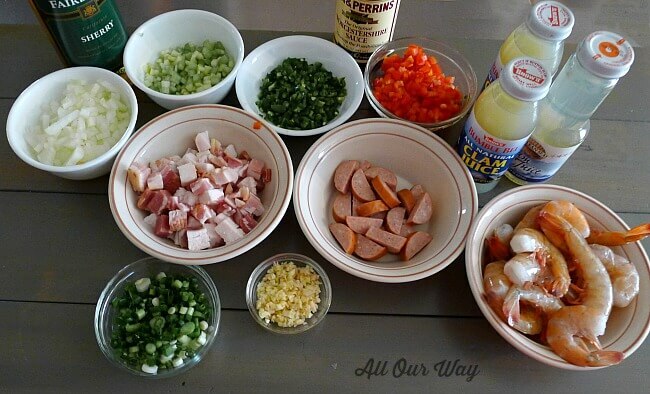 It has been a bit since I had gumbo…need to make this soon. OK so I’ve never had gumbo!! But every time I see it or har about it I say to myself that yes, yes, I do need that in my life. Will have to try out your version! gumbo might just be my favorite thing ever. I love it so much, especially the part about it being so forgiving! I love that about it! The roux is really my favorite part of it, and i love the okra too! My husband would roll over and do tricks if I served this up for dinner! It looks and sounds delish! Gumbo has been on my list of must make for sooooo long now. I LOVE the shrimp in yours! I think it’s time to finally do it- thanks for the inspiration! this sure looks hearty and delicious! I have never had okra or even seen it before! LOL Mom never had anything like this and I guess I never got curious to try adding it. All the gumbo she made was pretty straight forward shrimps and sausage. i am so intrigued now by how delicious this is and get introduced to new ingredients! Oh My Gosh…this Gumbo was really good. Followed recipe as written ….added extra seasoning to my liking as it suggested. Delicious!! I looove stew, but damn never tried making shrimp gumbo. I will be making it very soon, it looks absolutely delicious, so filling and delicious! The flavors, all those veggies, and shrimp….and the rice….can I please have a bowl ?! Now this is what I call comfort food. This gumbo looks so good! My husband is obsessed with southern food, he will love this! Mmmm. I haven’t had a good gumbo in quite some time. This one hits the spot 100% for sure! I love how versatile gumbos are! And I love your insight on the tribal aspects with the ingredients! Oh – and you used okra! Love that! Im SO trying this!! Yum! Gumbo is one of my favorites. So much good stuff going on in this recipe too. I love the okra and of course the kielbasa and shrimp. I’d love to give this a try! I’ve never made or had gumbo before but it’s on my ‘to-try’ list! This looks fabulous I love all the flavors you’ve got going on! Gumbo is something I grew up eating in my grandmother’s kitchen and a dish my husband loves to make, but I’ve never attempted it. Definitely going to try it now. Thanks so much! I have no idea of what an authentic gumbo is supposed to taste like. I can tell you I made a recipe for one with a heavily cooked roux and no tomatoes or okra and it was inedible. Your version looks full of flavor and mjuch more to my liking. Thanks for the recipe! Hi, Charity! Let me say that we had a Louisiana born gumbo fan say it tasted better than she remembered.We’ve taken the gumbo several times to Mardi Gras pitch-ins and the pot is as clean as a whistle. It is good! !Let us know if you make it. 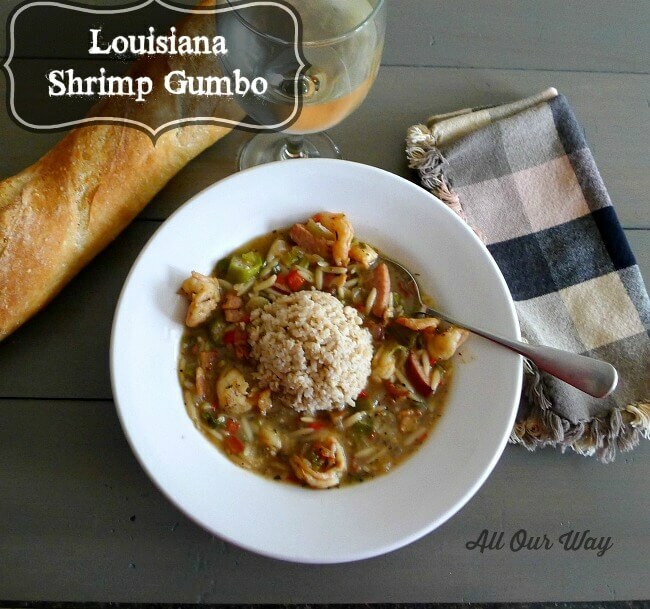 My husband absolutely LOVES shrimp gumbo and this recipe looks beyond delicious!! I’m so excited to share this with him!